Do I want to say please? This is really about pre show marketing. And very often it’s the bit that too few exhibitors find time to concentrate on. But on the premise that you are exhibiting at a trade show primarily to meet new prospects who have never done business with you before, it would serve you well to consider just who you want to meet and what will inspire visitors to put your stand at the top of their ‘must see’ list. If you are serious about attracting a particular company or individual to your stand you need to make contact with them prior to the show, possibly by sending them something that represents the value you attach to their visit. I advise exhibitors to identify the top 50, 100, or 150 prospects that they are currently not doing business with and create an individualised – and possibly themed – promotion which will say: “I value your attention to this item, and I would value your attendance on our stand at XYZ show even more”. This, of course, takes research. Ideally you would send something that is sufficiently intriguing to entice the visitor onto your stand and even something with a redeemable element when they do arrive. 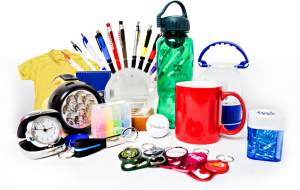 Professional promotional merchandise companies who are faced with such a brief will offer you many creative options – but it might be worth reviewing one idea that set the exhibitor ahead of all his competitors. Some years back an insulation company attending a conference and exhibition needed to attract the attention of local authorities. They had an excellent record of customer satisfaction when installing the insulation itself. They sent out 150 left footed slippers with their logo embroidered on it. The promotional card suggested “if you want to feel warm and cosy about your insulation supplier visit stand X – and claim the right”. The slippers were duly despatched in jiffy bags and created a minor sensation within this sector. A high percentage of those who had received the slippers attended the stand, claimed the right, piles of which were on the stand – and ultimately generated conversations and business. Cheesy? Perhaps. But it was a very effective “please” which provided the high impact brand awareness desired. So what about thank you? This is easier – but often not considered objectively at all. At many of the financial services exhibitions I’ve seen piles of pens, pads, mugs, neatly arranged at the front of stands waiting for the PFCs – the Professional Freebie Collectors. And whilst some of these may end up on the prospects desk as a reminder, many end up at home or with the family. So what principle would I recommend here? Anybody that is attracted to your stand and performs, can be offered a reward for their services. You may be wanting to conduct some market research – and the promotional merchandise acts as a thank you. You may be soliciting participation in a competition or presentation – and here again a controlled delivery of an appropriate item of merchandise will serve as a thank you and a reminder. In an ideal world this reward piece should invite the prospect to the next stage of engagement with your sales or marketing team. If for example the item were to be enhanced by something which can be added to it later, possibly at a face to face meeting, it would be very effective. You arrive at an exhibition. You are greeted just inside the entrance by some attractive promotional person who hands you a bag which of course contains their promotional literature. The bag is always useful – and I’ve seen people offering the largest possible bags at exhibitions so that all smaller bags are put inside them (rather like Babooshka Dolls). But of course the largest bag contains a promotional message. 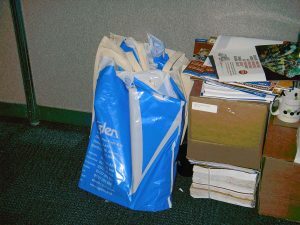 But back to the contents – it’s debatable as to when or whether you will actually get round to reviewing all the literature that you collect at a show. And it never fails to amaze me how exhibitors plan to give out literature on their stand when they know from personal experience that when they collect literature at the exhibitions they visit, they seldom read them or use them when making a buying decision. Today we have far more efficient methods of imparting information – electronically for example. But the real principle around distributing brochures of any description has to be will they reduce the chance of a future meeting to progress your business. “Thanks very much for calling – but I have your literature and I’ll get back to you if and when I need you” is the far too often used response to a sales person following up on a prospects stand visit. If the prospect believes or perceives that they have all the information they need, you will find it extremely difficult to get in front of them later – if this is your wish. Instead you could of course show them the catalogue or brochure or report or information pack that you will be only too happy to bring into them – on a personalised basis – as long as they give you their contact details and preferred follow up process there and then. So if you are looking for budget to train your staff to be saying the right things on your stand you might want to consider finding it from your intended investment in brochures. Apply the principles – is it a please? Or is it a thank you? And is it going to help or hinder your progressing your business?